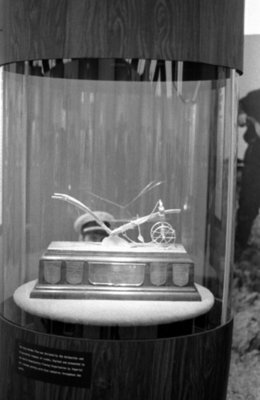 A black and white photograph showing the Golden Plow Trophy at the World Plowing Match on September 26, 1975. The World Plowing Match was held in Whitby and Oshawa from September 23-28, 1975. World Plowing Match, 1975, Brian Winter. Whitby Archives A2013_004_410D.